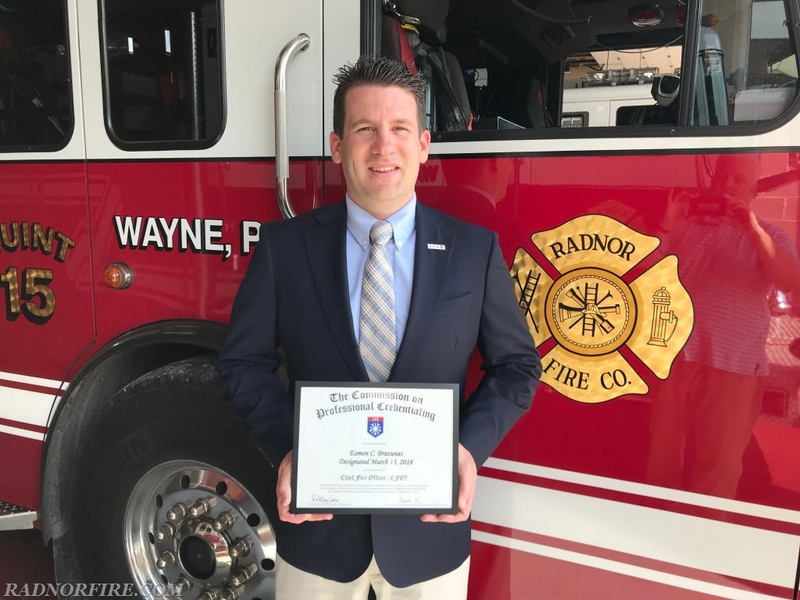 WAYNE, PA (May 11, 2018) - Eamon C. Brazunas of Radnor Fire Company has successfully completed the process that awards the professional designation of "Chief Fire Officer" (CFO). The Commission on Professional Credentialing (CPC) recently met to confer the designation. Brazunas becomes one of only 1,305 CFOs worldwide. Brazunas has been the Administrative Director with the Radnor Fire Company since 2008. Brazunas is also a volunteer firefighter/EMT with the Berwyn Fire Company where he has served for 20 years, and has been the Fire Chief of Berwyn since 2013. 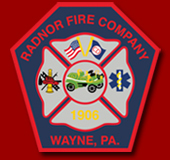 The Radnor Fire Company is a combination department that protects 35,177 residents between Radnor Township in Delaware County and Tredyffrin Township in Chester County. The Company provides fire suppression, rescue, basic life support, and advanced life support medical services. An average of 3,000 fire and emergency medical services calls are handled annually by the Company. The Designation program is a voluntary program designed to recognize individuals who demonstrate their excellence in seven measured components including experience, education, professional development, professional contributions, association membership, community involvement and technical competence. In addition, all applicants are required to identify a future professional development plan. The CFO designation program uses a comprehensive peer review model to evaluate candidates seeking the credential. The Commission on Professional Credentialing (CPC) awards the designation only after an individual successfully meets all of the organization's stringent criteria. Achieving this designation signifies Brazunas' commitment to his career in fire and emergency services. This professional designation is valid for three years. Maintaining the designation requires recipients to show continued growth in the areas of professional development, professional contributions, active association membership and community involvement as well as adhering to a strict code of professional conduct. The Commission on Professional Credentialing, an entity of the Center for Public Safety Excellence, Inc., (CPSE) administers the Designation Program. The CPC consists of individuals from academia, federal and local government, and the fire and emergency medical services profession. To learn more about CPC, visit www.cpse.org.